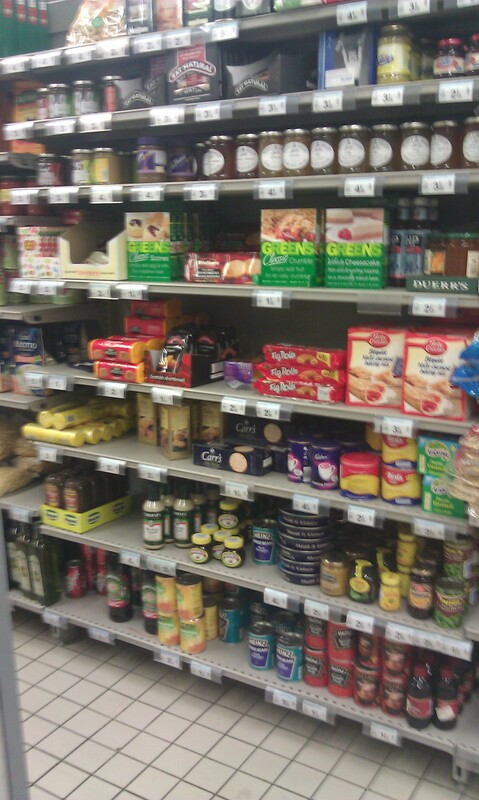 When abroad, taking a look at the international aisles in supermarkets can be such an eye-opener. Sure there’s the sheer fact that a whole culture can be defined by a few jars on a shelf, but that’s even before you’ve taken a look at the astronomical prices. 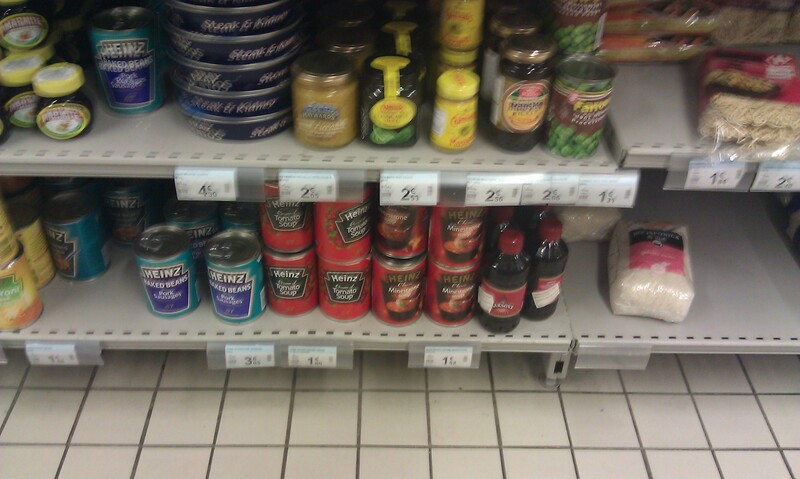 So imagine how excited I was, when rocking up at my local Carrefour, I stumbled upon a veritable plethora of British goods. So this is what defines British cooking and presumably, if we are to believe the 13th century principle of supply and demand, it also denotes what we Brits abroad simply can’t live without and for which we are willing to pay through the nose. We may have tried to invade France before and failed but these 8 shelves are all ours. What looks like a Fray Bentos Steak and Kidney Pie for what looks remarkably like 4 euros and 90 cents – shocker! Piccalilly?! Never eaten this in my life and at over 2 euros, don’t think I will. Never mind what it is, so long as I can smother it in some kind of sauce. Because just look at the amount of condiments and sauces the aisle has to offer: HP Sauce, mustard, Sarson’s vinegar, and not just savoury; sweet too: cranberry, mint jelly, even custard – no course is spared from our compulsion to cover it in another strong tasting sauce. And even more controversially, this aisle settles the age old argument of what is the best brand of tea. 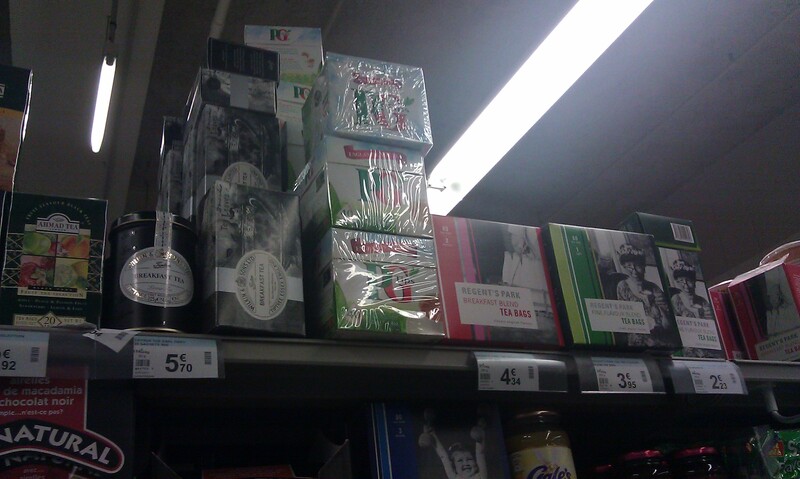 In one fell and conclusive swoop, Carrefour has named the winner of this title: PG Tips. And given that it’s priceless, who knows how much us foolish Brits are willing to part with to get our mitts on it. Well, I always prefer Yorkshire Tea personally, but that’s a topic not only for another blog post but for a whole new blog! Apologies for the blurriness - taking photos in supermarkets is a tricky business!This is how obsessed we are with tea - again apologies for the blurriness. This is how obsessed we are with tea - again apologies for the blurriness. That’s fantastic! Particularly the custard; have you ever had a conversation with a French person about custard? It gets very confusing very quickly. The main problem is that Bird’s custard and Crème Anglaise are two different things, but the French think it’s just Bird’s custard. Sacrilege! Also, loved the steak and kidney pies! Yeah, you’re right, the French Crème Anglaise is really runny and far too sweet – they ruddy love it though. As for Fray Bentos, just no – never had one but the thought of it isn’t right. Good observation- I always hate it when you are abroad and can’t find what you are looking for. Although these foods mainly seem quite old-fashioned. I always notice how UK supermarkets have a huge amount of aisle space dedicated to crisps! True, but I think we’re one of very few nations which dare to try different crisp flavours – all I ever find in France is ready salted, paprika or bizarrely bolognese! But you truly can’t beat the old British classics like steak and cheese and onion; even prawn cocktail is better than ready salted in my eyes!